California is perhaps the most well known state not only in the U.S. But worldwide. It is widely regarded as the state of celebrities where millionaire movie stars and other rich people live. It is without a doubt the most populated state in the country and also the 3rd most extensive state. The state's diverse geography extends far from the pacific coastline in the west all the way to the sierra neveda mountains in the east. The redwood forests inhabit the northwestern area and the mojave desert is found in the southeastern region of the state. In the center, the state primarily is regarded as a major agricultural area. California is home to the high and lowest elevation points in the country, and has the 3rd longest coast out of all the states. Earthquakes are a popular natural phenomenon in the state due mainly to the Pacific ring of fire, and roughly 37,000 earthquakes are documented in the state each year. California is also known for the gold rush which began in 1848 and brought about significant social and demographic changes. This also encouraged mass immigration to the state from within the U.S. And also abroad. Later in the 20th century California began to develop extensively in the entertainment industry and also developed and large state tourism center. Not long later, California made great advancements in the technology and information areas, spurred by the boom of Silicon Valley. Another interesting fact about the state is that more than 50% of the freshly harvested fruit in the country is cultivated in the state of California, as well as a large number of vegetables. 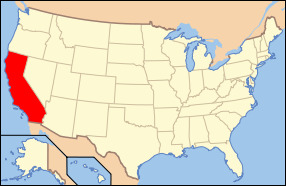 Aside from the very popular entertainment industry, California is also known for its major cities. San Francisco, Los Angeles, San Diego, San Jose, Sacremento, Fresno, Long Beach are a few of the more popular cities within the state. These cities also serve as prime tourist destinations as they area abundant in entertainment, exotic foods, and pleasant scenery. Due in part to its large population, California is easily one of the country's leading consumers of energy. Because of the high electricity demand within the state, California actually imports more electricity than all the other states. As a result, the state has built some of the biggest and most advanced renewable energy stations. Wind Turbines, Solar Power Plants and other renewable energy sources are common in the state as well as a large number of dams generating hydro-electric power.